Welcome to the office of the Chancellor. M.D. & Ph.D. in College of Medicine. Director of Bio R&D Center of Erom Co., LTD.
Dr. James Hwang graduated from the Medical College of Seoul National University, where he also earned his Ph.D. He lectured at Seoul National University, and studied Immunity Remedies for Cancer and Holistic Medicine at Fridenbailer Hospital, Wesselbron Hospital, and the Bio-Med Hospital in Germany. Dr. Hwang left his post as a professor to open his own clinic, where he specialized in degenerative diseases, including cancer. 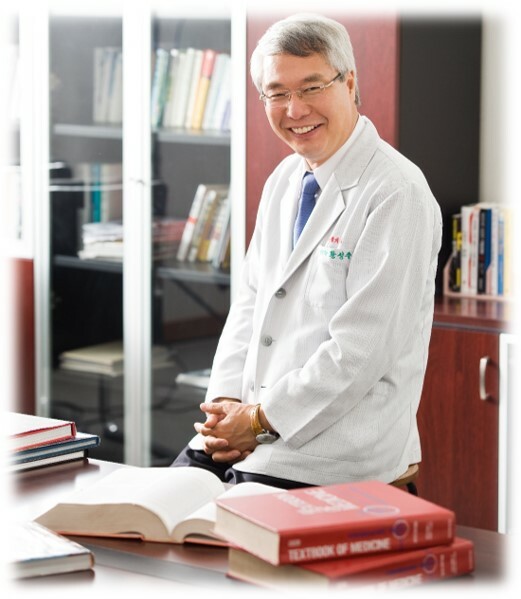 Dr. Hwang uses both state-of-the-art medical techniques and holistic principles to care for his patients. He believe this method greatly minimizes the harmful side effects associated with modern medical treatments. Dr. Hwang also spends much of his time on preventive medicine, and continues his research into increasing the benefits of treatments for cancer and other degenerative diseases. He is currently practicing the Mistletoe Immune Remedy, which is used in Germany with outstanding success. And through the use of an Immunity Cocktail, Dr. Hwang hopes to lessen the unpleasant effects of chemotherapy. Such treatments and therapies have garnered his clinic much acclaim as a top cancer treatment center.